If there's anything you've learned about me by now, let it be this: I LOVE COOKIES. So does Billa. I love that hand-held portion of sweet, sweet goodness right in the palm of your hand. Cupcakes come close, but there's the wrapper and other accoutrements one must deal with. Cookies are infinitely better. No mess, no fuss. Just simple sweetness wrapped up in a couple of bites. Heaven! Ever since Billa and I went to the cookie party a couple of weekends ago, I've been obsessed with the homemade Oreo cookies the hostess made. They were soft, like whoopie pies, but they tasted just like the real deal. I was in LOVE at first bite. She promised to post the recipe on her blog, but I'm not very good at being patient, so I went scouring for one on my own while I waited. Y'all, I need to be more careful about adventures like that...I was afraid my keyboard might short out from all the drool! I found the following recipe on Smitten Kitchen, which apparently came from the book Retro Desserts by Wayne Brachman. If I'm being perfectly honest, this recipe was not what I expected. The cookies are crunchy, not soft, so I ended up being a little disappointed. But they were still tasty, so it's only fair to share the recipe anyway. 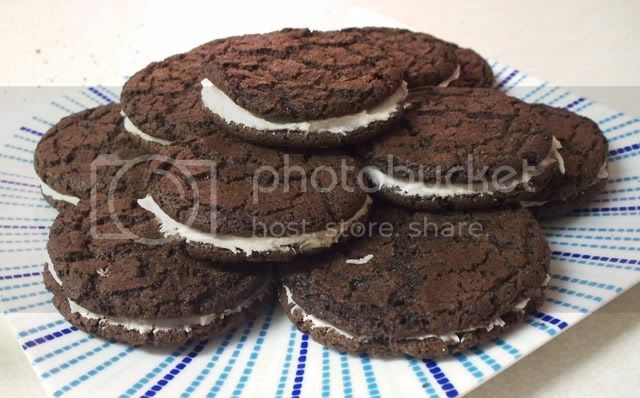 If you ever wanted to make homemade Oreo cookies, crunch and all, this recipe is the way to go! 2. In a food processor, or bowl of an electric mixer, thoroughly mix the flour, cocoa, baking soda and powder, salt, and sugar. While pulsing, or on low speed, add the butter, and then the egg. Continue processing or mixing until dough comes together in a mass. You may need to get your hands in the mix and knead it all together. It will be a very stiff dough. 3. With your hands, roll the dough into small balls and place on a baking sheet, about two to three inches apart. Using slightly moistened fingers, flatten the dough a little bit. Bake for 8-9 minutes, rotating once for even baking. Place on a rack to cool. 5. To assemble the cookies, in a pastry bag with a 1/2 inch, round tip, pipe teaspoon-size blobs of cream into the center of one cookie. Place another cookie, equal in size to the first, on top of the cream. Lightly press, to work the filling evenly to the outsides of the cookie. Continue this process until all the cookies have been sandwiched with cream. Smitten Kitchen made a note about the amount of sugar on her blog; she said that the wafers come out sweet, unlike real Oreo wafers, so she gave a range of 1 to 1 1/2 cups of sugar. I personally am on a quest to reduce the amount of sugar in my life, so I have re-posted this recipe with a smaller amount of sugar. Feel free to use the original amount as you please! As I noted before, the cookie itself is crunchy rather than soft. Don't over bake the cookie, otherwise it will burn quickly.You could probably add things like chili powder and cinnamon to the wafer recipe if you wanted to mix things up a bit. You could also add mint extract and green food coloring to the cream filling to make your own mint Oreos. Add other extracts and colors to be more adventurous! Your such a creative cook! You really made something mouth watering just from a scratch! I wished I have a mind like yours. Thanks Rose! I can't take all the credit though--there are tons of creative cooks out there, including you! I truly believe we all have our own brand of creativity within us, so go for it! Yum! This looks so great as being from just a scratch. I should try to be creative by making some recipe with the ingredients that are already in my kitchen. That is really so good.